(Olympia, WA) Recent public statements made by Senator Ann Rivers has the medical cannabis community in Washington State very upset, with many patients questioning her integrity on this issue. Specifically, the uproar revolves around her comments at a press conference on whether a medical patient and advocate, James Barber Sr., was telling the truth in his testimony earlier that day on Senate Bill 5052, written and lobbied on by a group of I-502 licensees. This has been cause for great distress for Mr. Barber and the medical cannabis community. The recreational cannabis Mr. Barber bought did, in fact, contain pesticides in spite of the Senator’s comment that he was only making the claims “for the cameras”. Many patients have expressed concern over Senator Rivers’ aggressive anti-patient stance, and her most recent belittling of a patient to attempt to perpetrate falsehoods to promote her “patient protection” bill is very disturbing, to say the least. “I suggest re-assessing Senator Rivers’ involvement in any patient protection act legislation when she is more interested in protecting her district’s I-502 businesses at all costs. Even to the point of being aggressive and belittling patients and their legitimate concerns in a news interview,” said Barber. Upon further research, we found an article published at the website, “The Reflector”, that reports on the grower in question during an interview. He also claimed that, “People who purchase legal marijuana from a state-approved store will get a product that is more pure than that on the black market”. Mr. Barber gave us the details of his experience. On December 10th, opening day of the Cannabis Country Store, four grams of “Cinex” was purchased by Barber. “I came home and started smoking the first gram. It didn’t taste like “Cinex”, but tasted off a bit. I thought it was just me and my screwed up medical conditions. So I finished it,” he said. 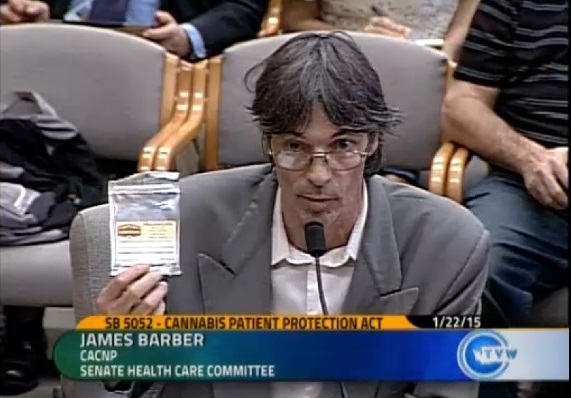 Mr. Barber made an appearance at Sen. Rivers’ public hearing on her latest bill, SB 5052, titled as the “Cannabis Patient Protection Act. He wished to point this out why recreational standards are not safe for patients or conducive with their health needs to the Senate Healthcare Committee of which Sen. Rivers is a member. “So I took her advice to use a recreational store because, in her words, they are “safe access” and in “strict compliance with state laws”. She said I was basically a criminal if I didn’t,” he said. In a press conference Sen. Rivers held after the hearing, she makes a claim against his credibility on whether what he presented to the committee had warning labels, that he only did it for the “cameras”. “She made a false impression as so the media would ignore my calls from the wild and basically defamed me with falsity,” he said. In response to the controversy, Green Buddha owner Muraco Kyashna-tocha of Seattle sent an email to Sen. Rivers, also sent to Mr Barber. She also stated that her own personal research has not found a single bud produced in a pesticide free fashion within the I-502 system. “Thus when the Agrijuana producer claims “we know it’s all organic” “there are no pesticides” he is absolutely LYING. Quite disturbing to see a bill this heavily lobbied by business interests who obfuscate the truth,” she said. The voters of this state did not pass I-502 to allow recreational businesses to get rich off the backs of medical patients. The Legislators of the state would do well to remember this simple fact. Sen. Rivers needs to back away from trying to take the lead on cannabis issues as they relate the medical use. It is obvious from her comments about Mr. Barber and others who expressed serious concerns that she does not take this issue seriously. To do this after the first hearing on her bill has many wondering if she is the right person to be in charge of important policy reform issues. One of the main goals of Initiative I-502, as originally written and passed, was allegedly to create a policy change from enforcing marijuana crimes, to properly enforcing property crimes by ‘legalizing” marijuana for persons over 21. The “partnership” immediately orchestrated numerous secret meetings for I-502 implementation, to further remarket the marijuana prohibition bureaucracy and directed the Washington State Liquor Control Board (WSLCB) take steps to get rid of medical marijuana. Despite the best efforts to hide these meetings, enough information began to leak out to the marijuana activists, that they were able piece together how the “partnership,” influenced the WSLCB. The documents they obtained show how the “partnership” set out to increase local law enforcement funding and de-incentivize medical marijuana. These public records obtained by various individuals and advocacy groups also show the subversion began with the secret Association of Washington Cities (AWC – a non-profit made up of corporations and government agencies) and law enforcement meetings with the Washington State Liquor Control Board. The messages and goals for this new Meta organization was clear, get rid of medical marijuana, and divert I-502 revenue to the cities and counties. The “partnership” grew to include the Washington State Association of Counties (WSAC),Washington Association of Prosecuting Attorneys (WAPA),Washington Association of Sheriffs and Police Chiefs (WASPC), Municipal Research and Services Center (MRSC), Washington Association of County Officials (WACO), Washington State Patrol (WSP), Washington State Department of Revenue (DOR), the Washington State Attorney General’s Office (WAAG) and Washington Association For Substance Abuse And Violence Prevention (WASAVP). The WSLCB arranged to have the legislature “give them cover”, by creating legislation that would allow them a “place at the table,” for medical marijuana discussions. This strategy is outlined in an email from WSLCB board member Chris Marr to the agency director, Rick Garza. The email from Marr also introduced the other players in the Meta leadership. These players, knowing or unknowing, were Senator Ann Rivers and I-502 entrepreneur Ezra Eickmeyer. Eickmeyer, through Senator Rivers, proceeded to draft SB 5887, which proposed to create a medical marijuana work group, however, the bill did not pass. Senator Rivers and Eickmeyer then acted to get a medical marijuana work group passed “Amendment #224” in the state’s budget bill, SB 5034, to which Senator Jeanne Kohl-Welles objected to because “too many conclusions would be drawn behind closed doors. Senator Kohl-Welles put out an email on June 2, 2014 addressing concerns about the process. The IAD is staffed by officers considered to be loaned state employees to the federal government subject to the Westfall and Federal Tort Claims Act. Essentially, the federal government also had a hand in I-502 secret rulemaking process through the cross designated members of the WSP and in direct meetings with the DEA and U.S. Attorney’s office. Soon after the passage of initiative I-502, the broad and powerful “partnership” had managed to convert the policy goals of redirecting law enforcement funding to property crimes to adding local law enforcement funding and getting rid of medical marijuana. The Washington State Liquor Control Board had arranged its “place at the table”, and the “partnership”, managed to set forth a mechanism to glean law enforcement funding increases and interfere with medical marijuana laws when I-502 appeared to advertise just the opposite. The medical marijuana work group had the same open public meetings problem as the I-502 implementation process. They also did not want the public to hear who it was they were working with in private and publically show how they arrived at its decisions. The Governor’s office, with help from the local U.S. Attorney Jenny Durkan did their part by making sure the public knew that the medical marijuana situation was “untenable”. The urgency for a “robust” regulatory system for marijuana was further ratcheted up with the use of a document referred to as the “Cole Memorandum”, which was actually requested by the LCB, and not a mandate generated by the U.S. Attorney’s office at the request of the Governor’s office. The following legislative session in 2014, SB 5887 and a new bill from Senator Jeanne Kohl Welles SB 6178, offered two approaches on how to integrate and de-incentivize medical marijuana. Representative Eileen Cody also proposed HB 2149 that same legislative session. All of the bills contained language which highlighted the recommendations of the medical marijuana working group. The battle of killing medical marijuana in the 2014 legislative session began in earnest. The legislators had several major hurdles to clear in order to kill medical marijuana. The most formidable of which was the fiscal impacts of the “robust” regulatory system which now included more law enforcement funding not included in the I-502 earmarks. The fiscal notes to the Ways and Means and House Finance committees, which were put forth at the last second, did not include the actual cost of implementing the ratcheted up “robust” marijuana regulatory scheme. Furthermore, the small business impact studies were incomplete further misleading the actual financial impact of the medical marijuana killing legislation. “The argument for the initiative was that it’s going to lower public safety costs, and now they’re saying it’s going to increase public safety costs with absolutely no data. (It’s) troubling,” said House Finance Committee Chairman Reuven Carlyle (D-Seattle) in an interview. Many marijuana activists claimed victory when all the medical marijuana bills failed to pass out of the 2014 legislative session. The 2015 legislative session is underway and the legislature should be informed of what the I-502 rule making process has become so they can properly achieve policy goals set forth by the public. We finally have the approximately 4000 pages of documents the Washington State Liquor Control board withheld from Arthur West and the public that a judge ordered them to be released.